February 1 marks the beginning of African Heritage Month in Nova Scotia. This is Canada’s oldest celebration of African Heritage, marking its 34th year this year. This years theme is “Educate, Unite, Celebrate Community.” This theme honours the legacy of community collaboration that has become the base for educating, promoting and celebrating this important part of Nova Scotia’s culture and heritage. It also creates awareness around the declaration by the United Nations of 2015 – 2024 as the International Decade for People of African Descent — an opportunity to promote and advocate recognition, justice and development. I encourage you to explore one of the many events taking place across the region! Halifax is currently investigating corridor-level transit priority on Young Street and Robie Street as identified in the recently approved Integrated Mobility Plan. Staff and consultants will investigate opportunities to install transit priority measures along Robie Street and Young Street, and a functional design assignment is currently underway. 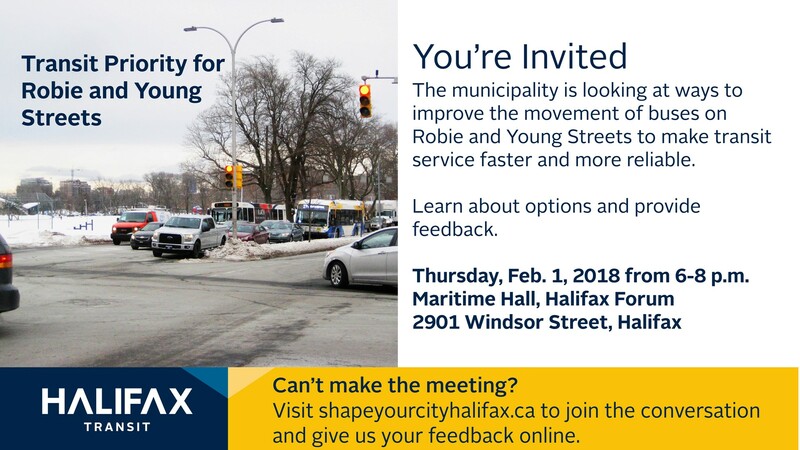 The public is invited to this open house session where members of the public will be invited to review and provide feedback on the potential design options for Robie Street and Young Street. The information collected from these sessions will inform the identification of the preferred option(s) and functional design. The pond will be dredged (dug out) during the winter of 2018. The winter was chosen to minimize the impact on park users and required park reinstatement. The scope of work would involve removing the water from the pond and removing the sludge from the pond bottom (typically 1 foot in depth). There will be temporary construction access of Sackville Street near the west corner of the pond. The temporary access would involve removing some fence panels. This location was selected along with staff from the Public Gardens to minimize the impact on the Public Gardens (trees, shrubs and other plants) and proposed winter maintenance. Indigo Parking and the NS Health Authority are offering a winter parking ban solution for those looking for a place to put your car. During an HRM overnight Snow Ban condition, what better way to show support for our hospitals and offer a parking solution for residents. All QEII hospital sites (VG, Halifax Infirmary sites) levy only $4 for such overnight public parking, with generous restrictions (enter lots after 430pm, exit before 8am the next day). This $4 maximum fee also applies 24 hrs on weekends and holidays. The Halifax Infirmary site even has this low fee in the underground heated garage under the Veterans’ Memorial Building. After last season’s hugely popular, sold-out “Piano Men” concerts, the golden-voiced Jim Witter returns to Symphony Nova Scotia! This time, Jim and his four-piece band relive the best of the ‘60s in a thrilling multimedia tribute to the timeless music of Simon and Garfunkel. Hear chart-topping hits like Mrs. Robinson,Scarborough Fair, Cecilia, The Sound of Silence, and many more in this immersive, spine-tingling salute to one of the world’s most beloved musical duos. Thursday February 8, 7:00pm | Inglis Street Elementary, 5985 Inglis St.
African Heritage Month Free Screening! John Coltrane was an outside-the-box thinker with extraordinary talent. His boundary-shattering music continues to impact and influence people around the world. This smart, passionate, thought-provoking and uplifting documentary is for anyone who appreciates the power of music to entertain, inspire, and transform. Set against the social, political, and cultural landscape of the times, Chasing Trane brings Coltrane to life as a fully dimensional being, inviting the audience to engage with Coltrane the man and Coltrane the artist. The 26th Halifax Beavers, Cubs and Scouts are hosting the annual Pancake Supper. It will be held on Shrove Tuesday, in the Parish Auditorium. The menu will consist of pancakes, sausages, cake and orange slices along with juice, tea or coffee. The pancake supper is a great opportunity to raise funds and bring families together, while being served by your youth and their Scouters. Any proceeds realized from this Pancake Supper go directly to 26th Halifax to support programming in Beavers, Cubs and Scouts. Admission: $8 per adult/$4 per youth (under 12). Tickets at the door.